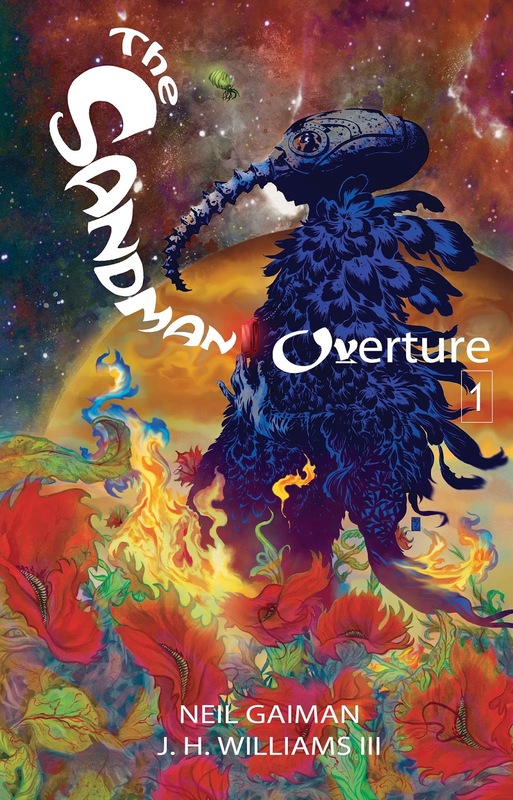 Thanks to my brother's munificence (no, my other brother's munificence), I recently acquired the long-awaited continuation of Neil Gaiman's Sandman. In keeping with his other work, this is a prequel: the story still ends how it ends, but Overture depicts the events immediately preceding Preludes & Nocturnes, and in so doing it reframes and adds context to the later (earlier) story. One of the most distinctive things about the original Sandman is its extremely varied art. The book regularly switched between artists over the course of its run, with each new one bringing their completely original style to the series. Characters' iconic signifiers remained the same (Death's ankh, Dream's dark garb and starry eyes), but they could look completely different, veering between realism and highly stylized cartoons and gorgeous impressionism. Overture only uses a single artist for its run, but Williams keeps the tradition alive by switching up his style over the course of the book. This is especially true in the back half of the book, when we see representatives of the many galaxies being destroyed. They are truly alien, and so each demands its own tradition of depiction. They vary from a hyper-intelligent (and extremely contagious) bacterium to a star to a machine and many more. One minor disappointment for me was that Overture breaks Dave McKean's incredibly run at making covers for Sandman, relegating him to a single variant. However, the new covers are wonderful. I should embrace the core message of Sandman and relish the good in this change. My favorite character in this arc is probably Hope, and that's due in no small part to her art. 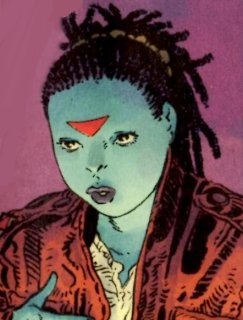 She has a unique look, vaguely African but simultaneously alien, and projects a terrific combination of curiosity and determination: when she makes up her mind about something, her jaw sets and she stares straight forward, her braids aligning in a row that perfectly communicate her resolve. A lot of old favorites return too, of course. I would have enjoyed more Death, but that's nothing new: I always want more Death. To be fair, she did get her own spin-off from the original run, so she didn't "need" more time here. She technically has a lot of work to do during the story, and while she doesn't speak much, there are several amazing near-full-page depictions of her as she harvests entire galaxies. Let's see... we get to check in with Desire and Despair, united as usual. Destiny plays a fairly significant role. Delirium gets a pretty big appearance, although not quite as large as I initially thought; the insane star sounded a lot like Delirium, and for a while I thought that they were the same. In retrospect, though, of course it makes sense that the star sounded like the personification of insanity. Likewise, I got briefly excited when I thought that we were seeing Destruction, before I realized that it was actually their father. Which, itself, is really interesting, since it (visually) aligns Destruction with Time. That's pretty accurate, but also presupposes an entropic view of the universe. Dreams stand out of time, so it makes sense that Morpheus wouldn't be particularly close to his father. Delirium is similarly unhinged from time. Time explicitly says that Destiny visits him most often, which certainly makes sense: Time is the garden, Destiny the pathway. Desire and Despair tend to be rooted in the present moment, without much attention to continuity; Delight probably once shared this aspect with them. Death and Destruction are both inextricably connected with the passage of time, though, with Destruction holding the broader portfolio of the two: the erosion of mountains into grains of sand, the collapse of structures erected by men, the snuffing out of solar systems, the eventual heat death of the universe, all inexorably linked to the passage of Time. One other question, which I had previously thought had been closed, is what changed Dream. In the other prequel stories and flashbacks to earlier periods in Dream's life, he's mostly defined by his rigid adherence to duty. He's not exactly cruel, but also unmoved by pity or compassion, whether towards himself or his enemies or his friends and lovers. Everything must be subordinated to his understanding of his role. This is different from the picture of Dream we see throughout most of the series: yes, he can be stern, but he is also capable of introspection, of re-evaluation, of picking a bigger good rather than a technically correct evil. Within the series, this is explained by his imprisonment by Burgess. Spending this time in captivity, divorced from his power, and seeing the consequences of the unraveling, jolts his personality, changing him and making him tentatively accept the prospect of change. After reading Overture, though, I wonder if we should more properly ascribe some or most of his transformation to the events of this story. After all, it is this adventure which immediately preceded his imprisonment; he was captured before he had a chance to act or reflect on its meaning. Furthermore, during those long years in the circle, he may very well have been meditating on these very events. On the surface, it would seem like this is a story that reinforces the old Dream and not the new: he failed to do his duty once long ago, and the universe nearly perished as a result, saved only with extreme effort and luck. And yet, the way he saves it points the way towards the new Dream. He discovers that he can bend the rules by sharing his plan with a non-living creature. That same creature was around only because he consented to travel with her, an act that very closely resembles compassion. He sees that Destiny's book is not infallible - how, then, can he be infallible himself? All of these tiny lessons point the way towards the freer, more thoughtful Dream that we will later know and love. One question that inevitably arises when dealing with sequels is how they should be incorporated to the canon. Should one consume the media in the order they depict? Or the order they were released? I think it's hard to go wrong either way with Overture. You'll probably appreciate it a little more if you're already familiar with the Endless and their dynamics; but this is also a pretty good introduction to them, and it doesn't spoil anything that will come later (although there are some nice, very subtle foreshadowings). On the other hand, if you've already read and enjoyed Sandman, I highly recommend reading this as well. It's more Sandman, and that's a wonderful thing. Okay! This is my final wrap-up post on this crazy huge mod I started working on almost exactly one year ago. I was hugely inspired by Failbetter Games' shockingly transparent post-mortem, which went into enormous detail about the sales figures for Sunless Sea and how they compared to the company's own internal projections. Since this is a free mod, I don't have any similar financial data to share, but I thought it might be interesting to share the data I do have regarding downloads, subscribers, and so on. First, timeline: the mod was initially published on Steam on November 29th, after the Thanksgiving holiday. As with previous mods of mine, I actively monitored the early adopter feedback and released quick fixes for early-reported bugs, initially averaging 1-2 updates per day. After the first week this slowed down, and I now average 1 week between updates. No new features have been released, and the latest updates focus more on quality-of-life issues and not so much on crashes or other significant problems. 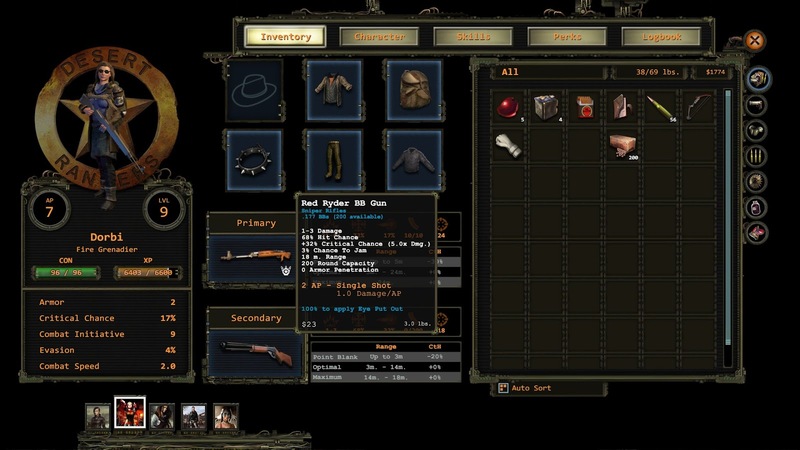 Within Steam, I get access to a few nifty author tools, the most useful of which are Item Stats. Here are the stats as of January 6th, 38 days after the initial release. There seems to be roughly a 50% conversion rate from visitors to subscribers. I think that's pretty good, although if the campaign cost money I'm sure the rate would be far lower. I don't have access to the analytics to know how many subscribers actually ever launch the campaign, or how many people who start the campaign finish it, but a little over 5% of subscribers will take the time to come back to this page later to vote on it. Again, that seems pretty good to me... I'm fairly certain that many more people complete the game than vote on it, partly because there isn't a good flow from within the game / Steam to this page, and also because people have better things to do with their time. On a negative feedback perspective, I didn't get my first troll until about 3 weeks after the mod was released, which is by far my best track record so far. I think I've gotten better at dealing with trolls now, which is to say that I don't. I used to try to respond to every piece of feedback, positive or negative, but realized that doing so was profoundly unproductive. I have a better sense now for when someone has valid criticisms, and when they're just trying to get a rise out of people, and have found that ignoring the latter group works well. Along the same lines, while I continue to reply to individual bug reports, I now reply to general comments in batches, which allows me to more gracefully provide different levels of reaction to different posters. Back to the data: my subscriber graph is shockingly consistent. My previous mods were all quite a bit more jumpy. 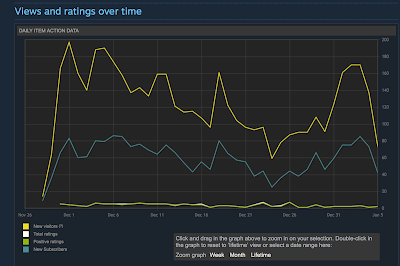 I think I'm now seeing a steady trend because we're in a fairly slow time for Shadowrun. I expect there will be a spike around the time that the Hong Kong mini-campaign is released, and maybe a smaller spike when the Commentary update goes out. Only super-fans are regularly checking the Workshop for new content, and I suspect that I'm mostly seeing a trickle of people who are looking for new content after beating Hong Kong or Dragonfall for the first time. The deltas, of course, look more dynamic than the overall trend graph, though if you look at the Y axis it's still pretty consistently hovering around 60 new subscribers per day. That initial spike at the beginning was when The Caldecott Caper first appeared in the featured Workshop slot in the Steam client, which is a huge driver of new subscribers. In Shadowrun Returns it would take me a week to claim this spot, but I think the much smaller mod volume for Hong Kong results in faster movement of mods. (Which works both ways, of course; I was booted off as soon as the next mod came along.) There's a very strong correlation between visitors and subscribers, as you would expect. The biggest dip came around Christmas Eve, when there are probably fewer people at their PCs. 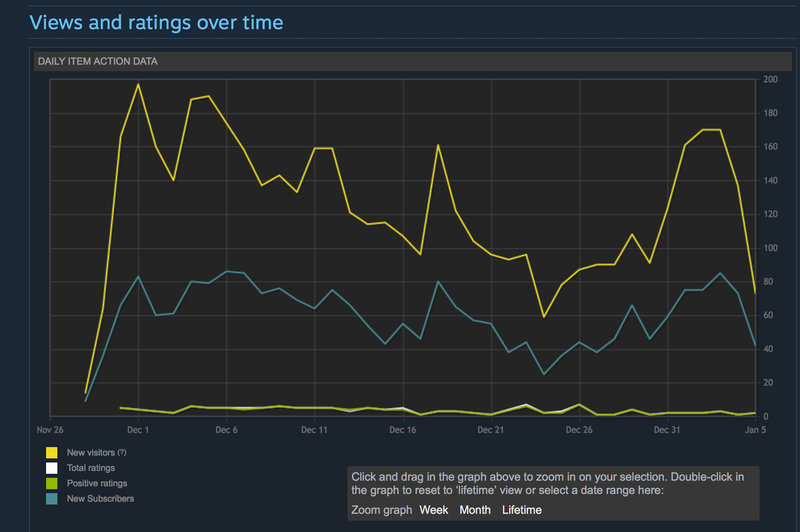 The drop-off at the end is misleading; I think that Steam's data trails actual results by about a day, but it includes the most recent day in the graph, so on any given day it will look like the current day is declining. For comparison, here's the current lifetime graph for Antumbra Saga. As you can see, this is much spikier, with the highest days an order of magnitude larger than the average. There's a good reason for each of those spikes: the release of the mod; the announcement of Hong Kong; the ending of the Hong Kong Kickstarter campaign; and the release of Hong Kong. You can also see a small but noticeable trend upward over the past month, which I attribute to new Hong Kong players who have encountered The Caldecott Caper and are going back to play the earlier campaign. 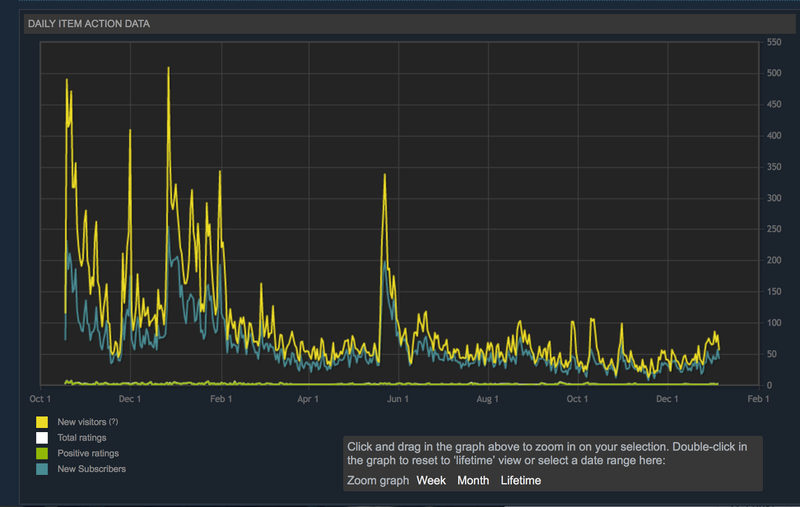 And, for the curious, here are the top-level stats for Antumbra Saga after the year-plus it's been on the Workshop. Overall this seems to track pretty closely with what I'm seeing for Caldecott, although the Saga has a slightly higher conversion rate. The total subscriber count for The Caldecott Caper at 38 days (2,203) is smaller than that of Antumbra Saga at the same age (3,507). This may be due to a smaller installed base for Hong Kong. However, subscriber growth for The Caldecott Caper is much more consistent than for the Saga. The Saga's mean acquisition is higher, while the Caper's median acquisition is higher. In a separate universe, I'm also maintaining a DRM-free version of The Caldecott Caper on the NexusMods site. Antumbra Saga got about 10% as much traffic and 10% as many subscribers on Nexus as on Steam; but Nexus users tend to be highly engaged, and I've gotten some great bug reports and feedback from there, so it's been worth the extra pain of maintaining two separate distribution portals. Due to the much smaller sample size, the variations here don't seem significant, it's all just noise. 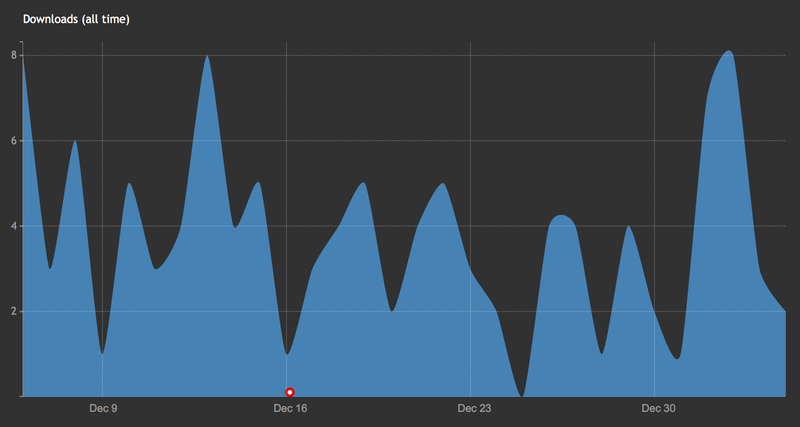 I'm averaging about 3 downloads per day, with an all-time high of 8, and the distribution is essentially random. 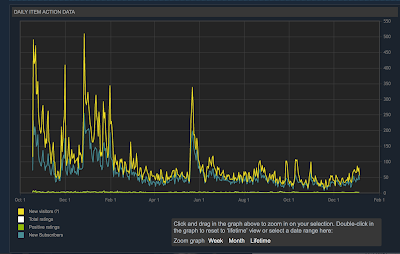 As with Steam, I expect to see spikes in the future around the time of major updates to Hong Kong, although historically Nexus has been more consistent than Steam (probably because there is no in-game portal to direct players here, so downloads are the result of deliberate searching on the part of players rather than the result of impulsive reactions to featured items in the workshop). I currently have just over 100 downloads on the Nexus, about 5% of my subscriber count on Steam. Posted a link to the campaign in the Shadowrun Returns subreddit. This is probably my most effective move yet, which isn't saying much. Started a thread on Good Old Games advertising the Nexus release. This has actually been a pretty good thread, although, again, the traffic on Nexus is tiny in comparison to Steam. Linked together Antumbra Saga and The Caldecott Caper, so anyone who stumbles across one will be able to easily find the other. Created a demo video for The Caldecott Caper and released it on YouTube (and then promptly neglected to promote it in any way). I periodically search for mentions of The Caldecott Caper on social media or the Internet as a whole. There are very few references, but the ones out there are encouraging; I've been especially pleased to see several women who responded to elements of the game, which is particularly gratifying to me. These sorts of things (personal tweets or tumblr posts or Facebook posts or whatever) are a great way to reach new players who wouldn't necessarily search through the Steam Workshop in order to find new campaigns, and also an excellent sign that people are personally responding in some way to the story I had to tell. It's possible that one day there will be a Let's Play video or a mention by one of the major Shadowrun fan sites or something, which would probably bring a significant new wave of subscribers to my campaign. In the absence of that, though, it will probably continue chugging along for a while longer, driven by a combination of word-of-mouth, serendipitous discovery, and feeding players' appetites for new Shadowrun stories. There probably won't be anything else worth reporting on this front, but if something unusual or exciting does happen in the future, I'll let you know! As I was preparing for the “reception” post of my Caldecott Caper retrospective, I belatedly realized that I never wrote anything about the actual story of the campaign. I think I kind of missed the forest for the trees by focusing on a particular aspect in each of the retrospective posts; it’s a story-driven campaign so everything relates to the plot, but I neglected to actually examine what I did with the story. I won’t recap the plot here - that’s what the game itself is for, and in any case I haven’t yet distilled it down to a good elevator pitch - but the following discussion is very spoilery, so you should probably skip this if you plan to play the campaign. I felt like the overall narrative structure of the game ended up working out really well… it isn’t by any means original, but it’s different from what HBS has done in any of their main campaigns, and I was happy with how it complemented the gameplay and advancement. The main framing device of the game is a heist, and you move through the same story beats that you would hit in a caper flick. There’s a brief intro where you establish your motivation and goal (Act 1). This is followed by scenes where you meet and recruit each member of your crew (Act 2). This is essentially the same as what I did in Corona, which in turn ripped off Mass Effect 2’s recruitment missions, which in turn was ripping off caper movies. I really like it because it gives each person a proper introduction, a turn in the spotlight, and forces you to at least try controlling them for a little while so you get a feel for their abilities and how they fit into the party. After an intermission where your newly-formed crew works out the details of the plan, you move into Act 3, where you undertake the preparations for the heist. This feels like the real meat of the game: you have a full crew, latitude in what order you approach things, and a looming deadline. This is followed by the heist itself, which occupies Act 4, and then the aftermath in Act 5. If I were to diagram the mission flow, there would be a straight line through acts 1, 4, and 5, and loops for acts 2 and 3. In those, you pick the order in which to do missions, and may tailor your approach based on your gameplay goals or your narrative goals. In contrast, Dragonfall and Hong Kong both have 3-act structures, with the vast majority of the game taking place in act 2. Players have a lot more freedom in those games, since at any time they can pick one of a half-dozen or so missions to play next, in contrast to the relatively more constrained structure I offer. Dead Man’s Switch is more constrained yet, since it has a predetermined linear path through the story. I guess my main objective was to get the narrative thrust and sense of urgency from Dead Man’s Switch, combined with some of the agency and freedom from the latter two games. The overall goal of The Caldecott Caper is inverted from the other games. In those, you need to earn money in order to advance the plot. 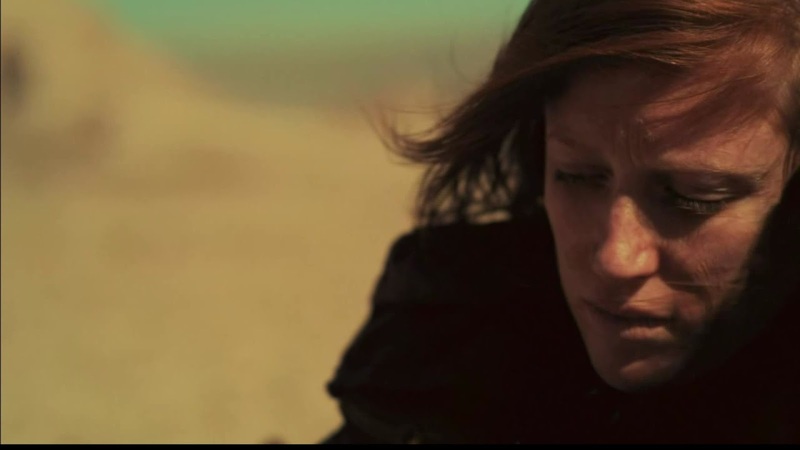 In the Caper, you need to advance the plot in order to earn money. There’s a narrative deadline on your actions, and the efforts of your character are focused on solving the crisis they face. I think this ended up being pretty successful. There’s a clear reason for your character to do everything they do, and you check in with the main plot frequently enough that it’s hard to get lost or confused about what’s going on. My hope is that the front-loaded choices and freedoms will help players identify with their character early on, and when the plot narrows and accelerates near the end, they’ll be even more invested in pushing it forward. One kind of interesting implication of this structure is a reinterpretation of legwork in these games. Traditionally, “legwork” is what you do at your base (the Seamstress’ Union, the Kreuzbasar or Heoi) in between missions: talk to people, line up jobs, make preparations. That’s still kind of the case here, but in a sense, all of the missions of Act 2 and 3 are themselves legwork in preparation for Act 4. That’s why you have the people in your roster that you do, and why you have access to the stuff in Act 4. I kind of like that way of thinking about the game. On its own, the heist might feel a little short or simple, but it becomes tied in with everything that you’ve experienced up to that point, since everything was done specifically to enable the actions you’re taking. There were a few specific goals I had in mind when I started writing this, and pretty early on I became interested in exercising several in particular. One overarching idea that I was drawn to was trying to have the player actually experience emotions, rather than delivering those emotions via exposition. I wanted to make the player a participant in the genesis of their motivations, rather than starting at the point where their motivations are locked in. Specific examples would help! Each of the three extant HBS Shadowrun games open with the death of a character who you are told is important to you, and whose death provides the impetus for the story to move forward. Dead Man’s Switch begins with you learning of Sam Watts’ murder; you witness Monika’s horrific death early in Dragonfall; and Hong Kong opens with an attack that kills close associates of Duncan, Gobbet, and Is0bel. In each case, your character is given opportunities to express differing reactions to the event. Your PC can imply that Monika was a former lover, a close friend, a comrade, or an employer. But you, as the player, haven’t experienced any of this. This does make a ton of sense when it comes to narrative economy: you want to jump right into the interesting part of the game, not spend a lot of time in backstory. And exposition pretty much always works in video games. We’re well-acquainted with receiving capsule stories and accepting what we’re told about ourselves. There’s sometimes even virtue in ambiguity: the vaguer the backstory, the more opportunity for you to project meaningful events and emotions into your character’s past. However, I was really interested in trying something different. I wondered, would it feel any different if you actually experienced the stakes: if you had spent meaningful time with the people involved, gotten to know their circumstances, had a real arc to your relationship, and then reached a crisis point? So, uh, that’s what I did. I feel like it turned out pretty well - the rhythm of the game makes sense to me when I play it, and the responses I’ve gotten from people have been pretty good. It’s kind of an open question whether, big-picture, this approach makes sense or not. I could easily have begun my game at a crisis point, and then cut out all the stuff before it, or moved it to later in the game, or made a second game with all the time I’d saved. I think it works well for this campaign in part because it’s different from the structure HBS has used, so players end up being a bit surprised by how this one plays out. Another area I was a little apprehensive about was “the twist”. At a certain point in the campaign, something surprising occurs, which recasts some prior information you have received and changes your understanding of what the game is about. I love twists, but they’re very hard to get right. If you broadcast it too clearly, then people will roll their eyes and complain about how they could see it coming from miles away, turning it into an active annoyance. If it comes from out of nowhere, though, then players can feel manipulated or just baffled; it may seem “unfair” in the same way that a poorly tuned combat would. There are a bunch of mechanical tools that are available to me as a game developer, as opposed to a novelist or screenwriter, which I also used/abused to hopefully help conceal the twist. One item I shamelessly stole from Neverwinter Nights 1, which (SPOILER) blindsided me by having Aribeth turn evil. Since she plays the Lord British / Merchant role, resurrecting you and selling you items, I hadn’t even considered that she might have the agency to get involved in the story that way. I do something similar here, by drawing the villain from the ranks you may not expect, selecting a “functional” NPC rather than one who appears primarily involved in the story. He's subtly and unobtrusively introduced, seems to just always "be there," and his perspectives seem to play a mechanical role in one particular mission, rather than a thematic role that would influence the rest of the campaign. I’m a little bummed that I lost what may have been my best trick: the crew advancement system. As designed, your crew progresses from the 1st through the 4th levels over the main course of the game. You can see all 4 levels from the beginning, and reach the 4th level a few missions before the end, so the UI is subtly reinforcing the idea that the game is ending. Only after the twist occurs does the 5th level of advancement reveal itself, and the 6th in turn doesn’t appear until right before the REAL endgame. Sadly, I lost this due to a still-outstanding bug with the save game system, but I really hope that it gets fixed so newer players can experience that unique form of manipulation. All of these elements combine to send subtle messages to the player that the game is over, but none of them are story elements, and so I think it works to deceive without feeling unfair. The content of the plot justifies the reversal, while the presentation obfuscates it. It seems to have been pretty successful; I’ve gotten multiple comments from players who were surprised by the turn of events. That’s all fun from a storytelling perspective: twists are a fun way to grab (or re-acquire) a player’s interest. But I also really appreciated how well it worked for me narratively. The campaign sits on top of a strongly-developed background of political and social conflict, which is quite well-documented in the source material and which I’ve been fleshing out in both of my campaigns. For most of the campaign, the political conflicts seem to be purely flavor. It explains why your environment is so messed up, why people are attacking each other, why your crew members behave the way they do. After the twist, though, these abstract power dynamics suddenly have very concrete consequences. The political becomes personal, and stuff that initially seemed like window dressing turns out to be the true heart of the story. Anyways, that’s another thing I enjoyed about the arc of the story. It doesn’t feel fake or unearned. From the very first splash screen, you’ve been reading about the toxic dynamics at play in the 2050s Bay Area, so the actions really shouldn’t be that big of a surprise. It’s just a surprise that it’s happening to your team, right now, right here. Finally! I wanted to recap tropes. I alluded to this briefly in a previous post, but it’s something I thought long and carefully about during my design phase, so I wanted to capture some of that internal deliberation here. To back up a bit: a trope is an element that recurs across many different stories. Tropes aren’t inherently bad or good, and I can guarantee that your favorite story is filled with tropes. Tropes often recur because they’ve been proven effective in the past, and new creators want to recapture that effect for their own works. “Boy meets girl, boy loses girl, boy regains girl” is a wildly popular trope, but it continues to drive storylines because it’s effective at grabbing our attentions. “A hero must defeat the forces of evil who seek to destroy the world” recurs a ridiculous number of times in fantasy RPGs, but it continues to be popular because it leads to epic games that appeal to a certain market segment. That first danger is an aesthetic one. The second one is more of a moral problem. Are your tropes reinforcing harmful or hurtful stereotypes? Does your race of evil monsters have black skin? Does the hero need to rescue a helpless princess? By producing a story that repeats these tropes, you’re reinforcing cultural ideas about the value of certain types of people, the proper roles for individuals to play, and the correct way to solve problems. Even if you, personally, are a rational and kind-hearted individual, you might inadvertently be contributing to a culture that encourages bigotry and negative actions towards others. Again, I don’t think that the solution is to remove all tropes, but rather to be aware of when tropes are being used. Identify what they are, what purpose they serve, and whether they may cause any harm. In some cases, you might want to press forward with such a trope… maybe you want to expose it and inject discomfort into the narrative, or maybe it’s powerful enough to be worth using. But it’s also worth considering whether you can tweak or subvert the trope. At an absolute minimum, that should make the story more interesting, since it will present a variation that your audience hasn’t encountered before. It will also give you an opportunity to make it your own and make it do what you want. While writing The Caldecott Caper, I did a lot of soul-searching about the refrigerator trope. Most simply put, this is a trope where something awful happens to the protagonist’s wife/girlfriend/sister, removing her from the story, and giving the hero the motivation to seek revenge on the enemy. There’s a crucial story beat in my campaign that invokes this trope. It was very deliberate on my part - I absolutely wanted the player to feel the sense of shock, horror, and anger that would propel them into the final phase of the game. But given the negative history around this trope, I wanted to be sure that I was minimizing potential harm. For starters, my refrigerator is kind of a quantum model. One of three people may end up in the refrigerator. One is a girlfriend, one is a boyfriend, one is a male friend. 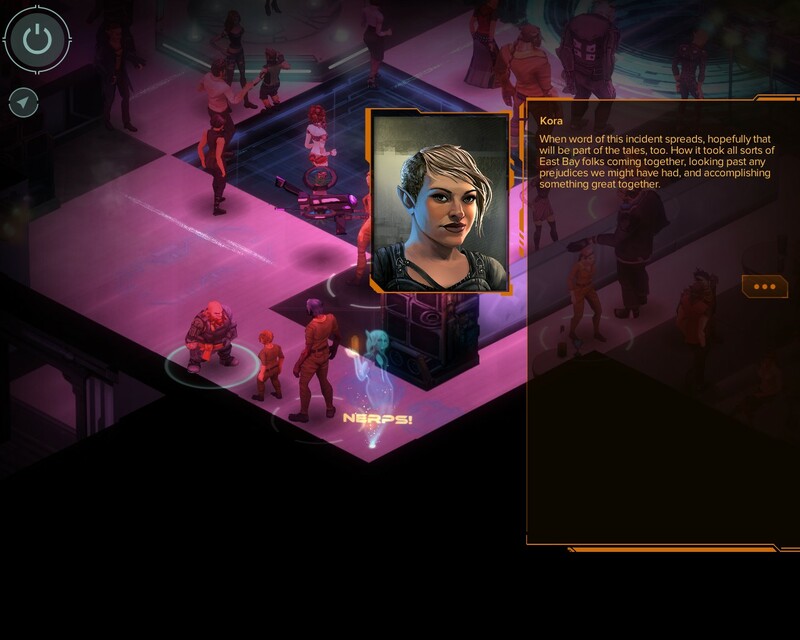 Furthermore, because this is a Shadowrun RPG, the player can choose to be either a man or a woman. So, all things being equal, there’s a 1 in 6 chance that this will be a traditional “angsty male avenging his victimized woman” refrigerator trope, and a 5 in 6 chance that it’s a different spin on it. However, that may be a little disingenuous. While I don’t have any analytics data about people who play my mod (I wish I did! ), I strongly suspect that it’s predominantly male. Of those, I suspect more players will romance a woman than a man. (I’m uncertain whether more players will romance a woman or abstain from romance altogether.) All that to say, while the traditional refrigerator is hypothetically a minority outcome in the game, there’s a good chance it will be disproportionately experienced by players; and, crucially, since most players will only play through the game once, they will only experience the game when it’s manifesting the original flavor of the trope. So, what could I do to mitigate or complicate the trope? There were a few things that hopefully make this a bit more palatable and less egregious. The player is invested. This arguably makes it WORSE, but a character only ends up in the fridge after the player has actively shown that this character is important to them. I as the creator am not telling the player how they should feel about this event; I’ve learned how they feel, and push the story in a direction as a result. Tenure in the refrigerator isn’t permanent. The player’s immediate motivation is to save the victim, not to avenge him or her, and if they make certain (difficult!) decisions, he or she can be restored to health. They’re removed to the sidelines for a few missions, but if they return, they will be at full strength and an equal partner in your eventual victory. Anyways! That was my thought process. I sometimes worry that I’m rationalizing this to myself, but hopefully the end result is different enough to engage players, rather than making them roll their eyes. The reception I’ve gotten has been pretty good… I haven’t gotten very detailed reactions from anyone other than my alpha tester, but the general comments I’ve seen have been positive. I seem to be outdoing myself in rambling, so I’ll bring this to a close now. Up next and last: a more quantitative look back at the release and reception of The Caldecott Caper. Hooray for data! Thanks to the largesse of Andrew, I’ve finally made my foray into Wasteland 2. Due to the magic of procrastination, my first experience is with the Director’s Cut, a significant overhaul that reworks many of the core mechanics of the game, and also tweaks a lot of the existing missions and characters. For some reason, Director’s Cuts seem to be an emerging trend among mid-sized studios with flagship Kickstarter properties: Harebrained Schemes with Dragonfall, inXile with Wasteland 2, and Larian Studios with Divinity: Original Sin have all made DC/Enhanced versions, and in every case have offered them for free to both backers and regular purchasers of the original versions. I’m a little curious about the calculus that makes this sort of re-work viable for studios at this scale… but that’s probably speculation for another post. 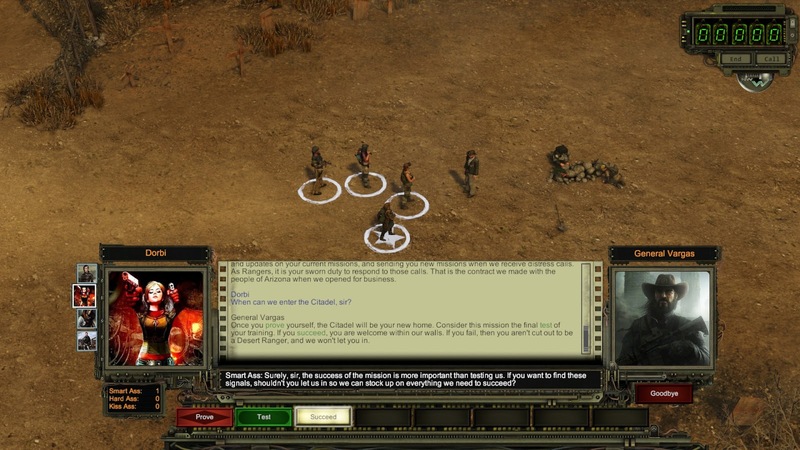 I’ve carefully avoided spoilers for Wasteland 2, but have taken a few specific tips in constructing my squad and orienting myself. I’ve been playing for a while, but am pretty sure that I’m still fairly early in the game, having recently reached Level 9 with most of my characters. I expect this will end up being a fairly massive game, so I wanted to do a little pre-post first to capture some of my initial reactions. No story spoilers in here, but some discussion of game mechanics and such. SKILL / FAILURE SYSTEM. I’ve actually read about this previously in Kickstarter updates to Torment: Tides of Numenara, but now that I’m actually playing with it, I see what the big deal is. It’s an excellent system that rewards you for investing skill points in relevant skills (by giving you a greater chance to succeed at tasks), maintains tension (by keeping a chance-based approach to success), and minimizes the incentive to save-scum (most failures can be re-tried). My single favorite dynamic is probably safecracking. If you succeed, the safe opens. If you fail, it does not, and you can try again. If you critically fail, the dial falls off the safe, and you can no longer attempt to open it. BUT, if someone on your squad has Mechanical Repair, they can attempt to fix the safe, and if they succeed, you can try opening it again. Crucially, you gain XP for fixing the safe as well as for opening the safe, so the “critical failure” may actually lead to a net benefit. It’s a really dynamic system, and I love it. AMBIENT WRITING. There’s terrific flavor text when you enter new areas or approach interesting landmarks. This isn’t presented modally, and you don’t need to read it or click through anything, but people who are interested can easily read it on-screen. It’s very well-written, but also recognizes that not everyone will want to spend time with it. XP GAINS. You get XP from defeating enemies and completing quests, of course, but you also get ridiculous amounts by completing myriad tasks. Disabling booby-traps. Healing teammates’ wounds. Picking locks. Bashing down doors. Fixing robots. All sorts of common tasks grant significant amounts of XP, often more than you would get from defeating a foe, which nicely rewards you for exploration and other non-combat activities. 4-PERSON SQUAD. I haven’t historically been a fan of Icewind Dale or other RPGs with multiple PCs, but it works pretty well here. There’s a lot that you do give up: no backgrounds for any characters (other that what you write yourself in their Biographies), not much personality, no opportunity for banter between PCs (I miss Divinity’s innovation here). But it fits really well with this game’s setting, with its post-apocalyptic, dangerous world with perma-death and disposable characters. I’ve coped with the limited dialogue by switching between characters during conversations, letting each PC deliver the lines that seem most appropriate to them. (Hailey when offering to help or discussing technology, Dorbi when seeking to manipulate or discussing explosions, etc.). This has zero in-game impact, but leads to a more engaging narrative in my head. MAP SYSTEM. It’s simple but effective. Major landmarks can be placed on your map by others, but the terrain is unknown until you travel there yourself. Along the way you can uncover oases and other points of interest. It keeps things interesting while not being needlessly complex. INVENTORY / LOOT. There’s a weight limit, but it isn’t too onerous, even at lower levels of Strength (at least in the early part of the game). 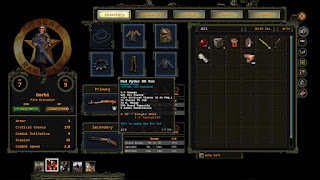 Items that can be safely sold are helpfully marked as “junk” and can all be sold with a single click. Other seemingly-useless items can be sold at will if you need ready cash, but if you wait until you find people who need them in particular, you can earn much more. It's too early to pass my verdict on the economy, but so far it seems decent... I spend money on precious .30-06 ammo for my sniper rifles, and once or twice a gun or piece or armor that looks worthwhile. WRITING. It’s pretty bleak, with a side order of goofy. Plenty of dark nihilism for people who enjoy that thing, along with occasional opportunities to feel like you’re doing good in the world. COMBAT. I’m mostly comparing this to Shadowrun, since that’s the system I’ve been using most lately, and there are a lot of similarities (turn-based, AP-based, etc.). The system in Wasteland is much more granular: individual people get initiative, rather than entire teams, and usually have around 8-10 AP to spend, rather than 2-3; in Shadowrun, a single attack is generally 1 AP, while in Wasteland it can range from 3AP for a pistol shot to 7AP for a sniper rifle. 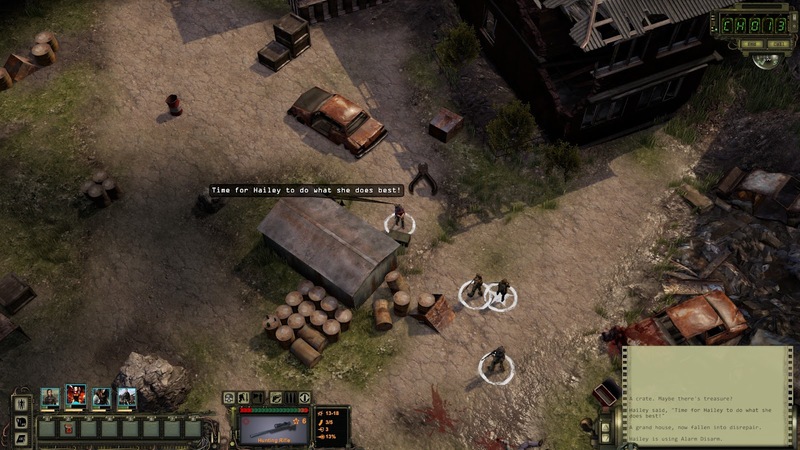 The initiative system can lead to some annoyances, such as when you can’t move a PC out of the way before a friendly fires a shotgun, or when your pistol-user gets to shoot before the sniper and you’re forced to overkill. Still, I think this has more to do with my own limitations than those of the system, and hopefully I’ll adapt to it. VOICE ACTING. It isn’t bad, but can sometimes be annoying, particularly when someone’s doing a fake accent or speaking very slowly. Fortunately you can click through to advance, but that sounds a little weird as well. I’m decreasingly enamored of the portrait-and-text-plus-speech approach; I love fully-voiced games like Dragon Age, but that requires a fundamentally different writing style than what’s used in old-school CRPGs. The former is like a movie script, the latter is novelistic, and mashing them up tends to end poorly. WALLS OF TEXT. This has been fine for most of the game, but entering the Citadel was a bit overwhelming: a dozen Rangers and dozens of books, with tons of text to get through and virtually no gameplay. Of course, I could have approached this differently - not talked to everyone on my first visit, or saved the books to read through later, or just quickly clicked through everything - but I’m OCD enough that I felt compelled to absorb everything, and felt overwhelmed and bored by the end. It’s a tough design problem to solve; ideally you would parcel out this sort of lore and character-introduction in morsels so they feel more like rewards and less like drinking from a fire hose, but narratively there isn’t a good way to split this up (other than the step they already took of denying access until you’ve played the game for a bit). That’s it! My screenshot finger has been itchy, which isn’t great… I’m mostly taking shots based on humorous dialogue or writing, leading to lots of identical-looking screens with unreadable text. Still, I’ve annotated them and tossed them up on an album, here for your reading pleasure.